Running can be thought of as a hopping activity. 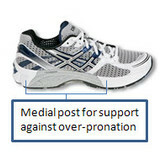 For a brief time during the gait cycle both feet are off the ground. You land with all the body's weight on one foot and then the other. Feet that have a "normal" arch are generally pretty flexible making them good shock absorbers. As each foot lands it rocks in a "Z" pattern (to dissipate shock) but because of its flexibility this foot tends to roll toward the inside too far. Any time you see a shoe that has a different color material or a plastic piece on the inside you know it's built for this problem (called pronation). The material or plastic piece is more rigid so as the foot rolls in, it feels resistance from the shoe. These shoes can help over-pronation along with all kinds of common injuries especially shin splints, plantar fasciitis and knee problems.